The I-25 North Express Lanes currently are open between US 36 and 120th Avenue, running one lane in each direction, alongside general-purpose lanes. The US 36 Express Lanes connect to the reversible Central I-25 Express Lanes between US 36 and downtown Denver. Lanes are open 24/7, but connect to I-25 Central Express Lanes, which are reversible running to Denver in the morning and to Boulder in the afternoon. These lanes opened in March 2016, from 120th Avenue to existing I-25 Central Express Lanes in Denver, which end at US 36. HOV/carpool, toll and transit options are available; motorcycles ride free. Uses a dynamic pricing system in which tolls can change in price depending on the time of day. 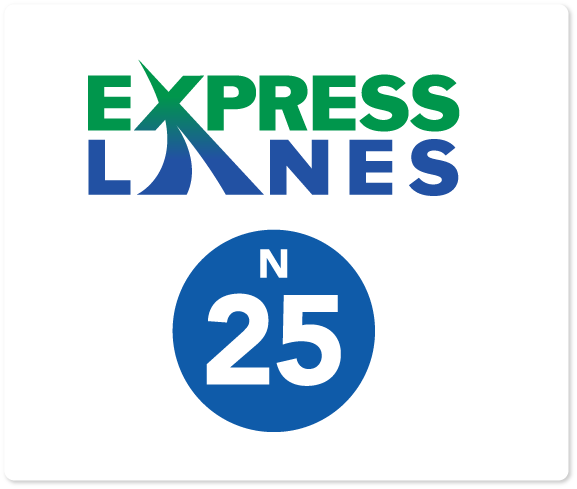 Drivers can enter this section of the Express Lane in different locations between US 36 and 120th, but pay only the toll price once to use the North I-25 Express Lanes from US 36 to 120th Avenue.